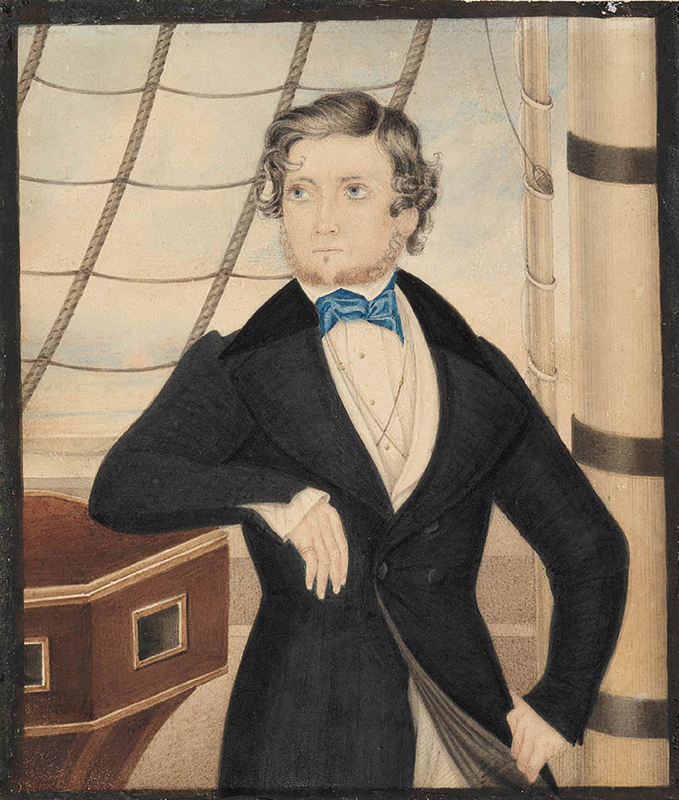 This left facing, 3/4 length standing portrait depicts an unknown young man, aged in his late 20s or early 30s, posed on the deck of ship docked in Sydney Harbour. He wears a long-skirted, double-breasted frock coat in dark grey cloth with a black velvet collar, wide notched lapels and narrow-fitting sleeves, slightly gathered at the shoulder and ending in split cuffs at the wrist, worn over dark cream trousers, a cream waistcoat with roll collar, and a snowy white linen shirt with a high collar and a sky blue ribbed-silk bow necktie above gold stud buttons, with two long, fine gold chains crossed over his chest (perhaps suspending spectacles).The subject’s long dark brown curly hair is parted on the left, his reddish brown whiskers carefully trimmed into a narrow beard with no moustache. His left arm rests on a wood and brass [table] displaying his gold ‘pinkie’ ring while his right hand, positioned somewhat awkwardly below the hip, holds back the lower front edge of his coat to reveal a light grey [silk] lining. Edmund Edgar, or Eagar (1804 – 1854), also known by the aliases Edgar Edmund Bults and Edgar Bult, worked as a house painter, engraver, and lithographer in London, and also as a miniature painter, before being convicted of robbery in 1825 for which he was sentenced to transportation for life. Edgar reached Sydney on 13 September 1826, aboard the convict ship Marquis of Huntly. By special request, he was assigned to the visiting artist Augustus Earle who had recently acquired a lithographic press and sought Edgar’s assistance in the production of his Views in Australia and other lithographs. Edgar also taught painting in Sydney, at Mr Gilchrist’s school in the late 1820s. Receiving his ticket of leave in 1838, Edgar was conditionally pardoned in 1844. From then on he seems to have concentrated on portraiture. In 1847 he was listed in Low’s Directory as an artist at Argyle Street, west of Trinity Church, in Sydney’s Rocks area. Other details about Edgar’s life remain uncertain – he may later have moved to Parramatta though another unconfirmed reference suggests he became a fruit and vegetable vendor in Sydney. He died a pauper at the Sydney Benevolent Asylum in June 1854. Subject is posed on the deck of a ship.